Four years after the city’s latest downtown development opened for business, where are the retailers? Window-shoppers crowd the sidewalks along the red brick Winooski Falls retail complex. Two helmeted cyclists are locking their bikes to a curvy steel bike rack. Students toting backpacks chat as they stroll through a large, park-like traffic circle. The sun shines down from a brilliant blue sky onto the tree-lined promenade; a man carries shopping bags back to his car. It’s a pedestrian-scale paradise, a perfect picture of new urbanism in the middle of Vermont. Trouble is, it is a picture — an artist’s rendering of what Winooski Falls was supposed to look like when merchants and residents moved in to the massive mixed-use development that has transformed the heart of the Onion City. The drawing was part of the information packet used to sell the citizens of Winooski on the project. Denizens of the neighborhood do crowd the sidewalks around Spinner Place, but most of them are waiting for busses to take them someplace else. Winooski dwellers can’t help but notice the vibrant urban community they were promised has yet to materialize. What they may not realize is that it’s also costing them money: almost $150,000 a year in lost tax revenue. The longer it takes to fill those storefront and office spaces, the more time it will take to pay off the loans that funded the construction. Only after those debts are retired will Winooski Falls start generating tax revenues that benefit the town. Winooski has been a laboratory for “urban renewal” experiments since the U.S. government coined the term and started making money available to blighted areas. In the late 1970s, federally financed wrecking balls leveled a large chunk of Winooski in order to transform the Champlain Mill into a retail shopping mall. The downtown essentially became a parking lot. There was even talk of covering the entire city with a dome. Using $66 million in government grants and loans, and millions more in private funds, Massachusetts-based developers HallKeen Management and its Vermont partner, The Braverman Co., essentially put Winooski back together again. The Winooski Falls project turned the former Champlain Mill parking lot back into a gleaming brick neighborhood recognized nationwide as a model of “smart growth” and “transit-oriented” development. The luxury condominiums at The Cascades aren’t selling as quickly as expected — HallKeen has sold about a third of the 70 condos in the building, some of them for as much as $750,000. Plans for constructing another 95 condos in a second building have been delayed until the economy shows signs of improvement. But the six-story Spinner Place is now home to hundreds of undergraduates from Champlain College and the University of Vermont. 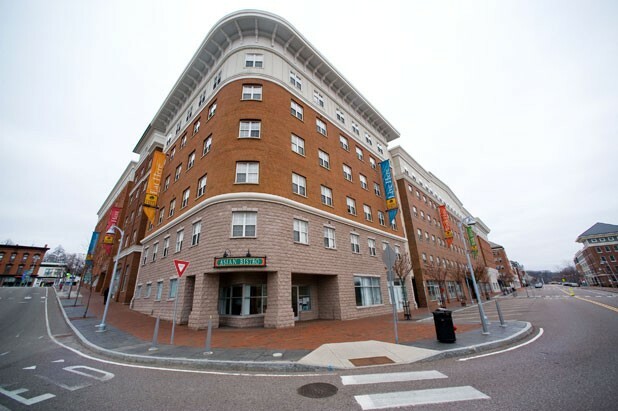 Champlain has a waiting list of students who want to rent apartments in Winooski. The 213 apartments at Keen’s Crossing, a mix of affordable market-rate units, are 95 percent occupied. Despite its moderate residential success, Winooski Falls hasn’t created the street scene envisioned by developers — one with “small shops, busy restaurants, and cafés serving coffee and fresh pastries.” And the retail component of the project, though by no means its largest income generator, plays a large role in determining the vibe in Winooski Falls. Newly appointed city manager Katherine “Deac” Decarreau says she’s heard from residents who are worried about the empty storefronts. Last month, she even acknowledged the problem in the Winooski school district’s monthly newsletter. Decarreau inherited the complex development project in July, when she was hired as city manager. A native of Winooski, she has assumed a lead role on the project, talking almost daily with the developers and city and state officials involved. He says HallKeen has done everything it can to attract tenants to the spaces, including lowering the rents. HallKeen has slashed lease rates by 20 and 25 percent — from $18 a square foot to $13.50 on Winooski Falls Way, and from $16 a square foot to $12.50 on Main Street. But for at least one would-be tenant, the problem wasn’t money — it was the limitations of the space. Fresh Market, a gourmet grocery on Pine Street in Burlington, was courted by HallKeen last year to open a second store in Winooski Falls, in the space with the year-old sign that reads, “Future Site of Neighborhood Market.” The owners, Robert Lichorwic and his wife Deborah Jones, were living in Keen’s Crossing at the time. Lichorwic says he envisioned a Winooski market with some combination of a deli, juice bar, coffee stand and sidewalk seating under canopies in summertime. In other words, exactly the kind of place the developers wanted. But the deal fell apart. There was not enough curbside parking and no place out back for Dumpsters. The front door was the only option for loading and receiving. Lichorwic says HallKeen tried to accommodate Fresh Market, offering, for instance, to place Dumpsters in the parking garage a short distance away. But Lichorwic says he didn’t want employees climbing over snow banks, dragging garbage cans into a “dark, dank” garage at night. Then the economy tanked and Lichorwic put his expansion plans on hold. HallKeen is betting that there are enough potential tenants willing to meet the challenges of Winooski’s downtown spaces. But it’s a tougher sell when there’s a glut of more convenient commercial real estate available in Burlington and Williston. Braverman predicts Winooski Falls is “about to explode.” He says two new retail tenants will soon occupy the entire block along Winooski Falls Way, across the street from the Champlain Mill. One is a locally owned bakery and café. The other is Opportunities Credit Union, which will take up the equivalent of three storefronts on the ground floor of Spinner Place. Braverman suggests that once those tenants move in, sometime this spring, other retail tenants will follow. Opportunities Credit Union may stay open late certain nights of the week, according to Marketing Manager Jodi Harrington, who sits on the Winooski City Council. But it certainly won’t fill the nightlife niche. For that, Braverman is counting on the waterside restaurant space in the Champlain Mill that used to house Waterworks Restaurant. Restaurateurs have inquired about the space, but HallKeen is holding out for just the right tenant. “The right chef with the right concept in this space is going to be incredibly successful,” Braverman says. Upstairs from the restaurant space is one of the other bright spots downtown — Champlain College’s Emergent Media Center, where future game designers and tech entrepreneurs are trained. The EMC is a hive of creativity and industry, filled with young people who burn the midnight oil to develop video games and iPhone apps. Another school is opening in Winooski next fall. The Community College of Vermont is moving its campus to the eastern edge of Winooski Falls, bringing 2500 commuter students to the city. Allen, the real estate analyst, agrees that the CCV campus will make the difference for Winooski. Until then, though, he doesn’t believe the mile-square city has sufficient population to attract the retail tenants. Winooski commerce seems to be a boom-or-bust proposition. Plenty of businesses have come and gone in the past few years — the Blue Star Café, Food 88, Dawg’s Packing and Shipping, to name a few. But the business owners across the roundabout who’ve stuck around say they’re doing great, and most of them predate the influx of downtown dwellers. Parking is also a problem. Laura Brown of Purple Shutter Herbs, a fragrant boutique on the west side of downtown, is concerned that Winooski Falls’ 945-space public parking garage — artfully concealed by the Spinner Place building — is so well shielded that customers can’t even find it. One restaurant owner says the development actually cost him customers. Donny’s New York Pizza used to fill up every day at lunch with employees of the Vermont Student Assistance Corporation when its offices were in the Champlain Mill, says pizzeria owner Kosta Michaelides. But ever since VSAC got its own building in Winooski Falls — with an in-house cafeteria — lunch at Donny’s has gotten a lot less busy. Donny’s does brisk business delivering pizzas but not to the hundreds of undergraduates living at Spinner Place. Luckily, the restaurant has loyal customers and does a good catering business, Michaelides says. Pouring a beer behind the bar, Michaelides reaches for a kitchen metaphor to describe the state of Winooski’s renaissance. 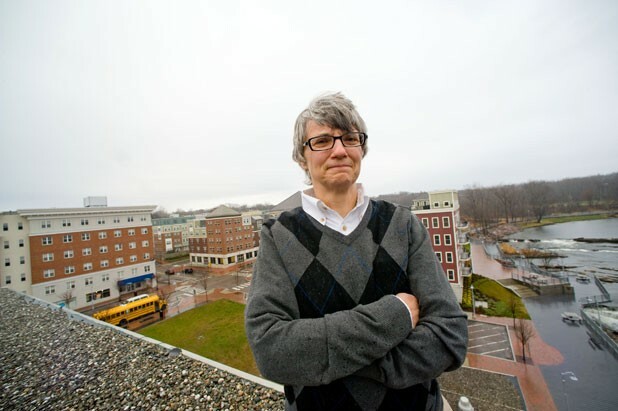 For her part, Decarreau remains optimistic about Winooski’s renaissance. Eventually, the recession will ease, the credit crunch will lift and money will start flowing again. With any luck, that will happen around the time thousands of Community College of Vermont students begin arriving at their new campus. “You’d like to believe you get it all right the first time out of the box, but you never do,” she says. Decarreau remembers walking the banks of the Winooski River as a kid, when the area was polluted with tires and other junk. Despite numerous setbacks over the years, and the current vacant retail spaces, the downtown has been transformed. Winooski Falls was supposed to be a huge windfall to city taxpayers, but in 2007, residents learned that it was actually costing them money. Last week, City Manager Katherine “Deac” Decarreau revealed the pricetag: $146,000 a year. The answer lies in the complicated details of the tax-financing district the city and state established to pay the infrastructure costs associated with building new roads, sewers, sidewalks and a parking garage needed to support Winooski Falls. In order to ensure Winooski taxpayers weren’t stuck paying the development’s collateral costs, the legislature set up Winooski Falls as a Tax Increment Financing district, or TIF, to pay those costs. The city borrowed the $23.5 million to finance the infrastructure build-out, which is being paid back over the 20-year life of the loan with property taxes collected from the new apartments, condos and stores sprouting up in Winooski Falls. The property within the TIF district, in other words, pays for the roads, sewers and lighting needed to build it. The upside of that arrangement is that city taxpayers don’t get stuck paying back the multimillion-dollar loan — the project finances its own infrastructure costs. The downside is that Winooski has to wait 20 years — until the infrastructure loan is completely paid off — before a dollar of that tax windfall from Winooski Falls property starts going into the general fund, to pay for city services like police, fire and the public library. The only money that continues to flow into Winooski’s general fund during that 20-year loan period is the taxes collected off the property that became Winooski Falls — the strip mall and parking lots — before it was redeveloped. That pre-development value was around $25 million. But something happened along the way that some in the city hadn’t anticipated: The state statute that created Winooski’s TIF district stated that the “base” value of the strip mall and parking lots, the $25 million, would remain “frozen” during the 20-year life of the loan. Two years ago, Winooski conducted a regular revaluation of all property citywide. Because property values had gone up since the last revaluation, the city’s tax rate was lowered to bring property tax bills in line. But since the “base” value of the Winooski Falls property was frozen at $25 million, that meant the city was collecting less tax money on that property — almost $150,000 less — because a lower tax rate was being applied to the land value. Another problem: Empty condos and vacant storefronts don’t produce as much in tax revenue as filled ones do, so paying off the loan is bound to take longer and rack up more interest. On November 16, Decarreau broke the bad news to the Winooski City Council. The city’s current $430,000 budget deficit — caused by rising health insurance rates, drops in state aid and the Winooski Falls tax loss — will necessitate raising taxes, slashing city services, or both. Without a tax hike or significant spending cuts, the deficit could swell to $1.4 million in a few years. That’s a lot of money considering Winooski’s entire city budget is only $5.8 million. “We’re going to have to count our pennies and be careful,” Decarreau says.